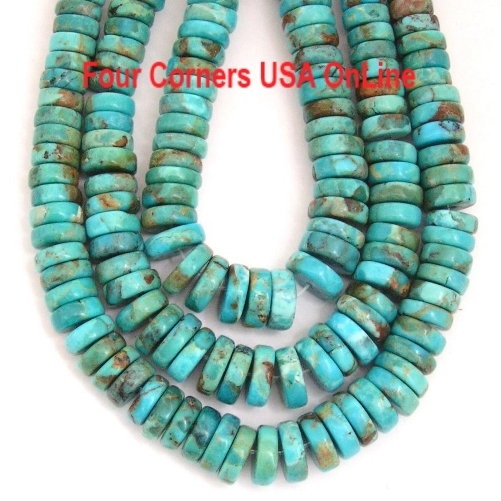 Gorgeous Graduated American Kingman Turquoise Designer Bead Strands for your Jewelry Creations. Blue, Teal and Coppery Green Turquoise Beads in traditional Wafer, Disc, Free Form and Kernel cuts. Our Arizona Kingman Turquoise bead strands are all natural color, natural cut stone and stabilized for durability (an acceptable and necessary process for enhancing the hardness of Turquoise for Jewelry Making). We are very passionate about Turquoise and proud to offer a varied selection of these beautiful (but getting scarce) American Turquoise Beads.